'Mysterious Ways' (Keith Keppel, R. 2003). Seedling# 96-28C. TB, height 40" (102 cm), Midseason bloom. Standards absinthe yellow (M&P 12-J-2) to walnut (12-E-6) at base, blended greyed violet (44-E-8); style arms chartreuse yellow (11-I-1), lavender lip; falls oyster white (10-B-1), light yellow (10-G-1) edge, hafts light chrome yellow (10-L-4); beards dandelion (9-L-4), cadmium yellow (9-L-8) in throat. Seedling# 92-69B: (seedling# 88-99C: ('Florida Orange' x ('Flashpoint' x (((seedling# 69-42D, sibling to 'Punkin' pod parent, x seedling# 68-59A, pollen parent of 'Marmalade') x 'Orange Empire') x 'Orangerie'))) x 'Island Dancer') X 'Crowned Heads'. Keppel 2004. Honorable Mention 2006; Award of Merit 2008. 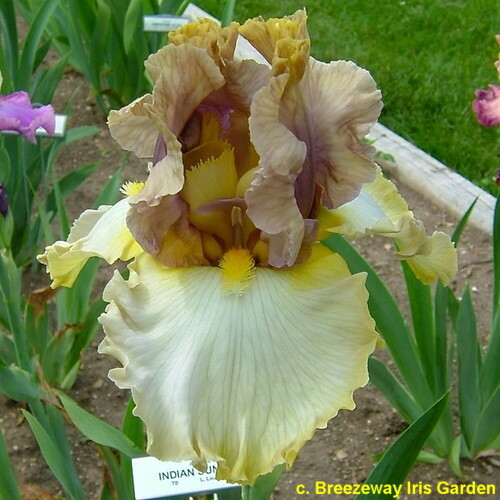 From AIS Bulletin #332 January 2004 Introducing MYSTERIOUS WAYS M 40" (((Florida Orange x Flashpoint sdlg.) x Island Dancer) X Crowned Heads). S. absinthe to cream, blended violet toward base; F. oyster, light yellow edge and darker haft, beards yellow. #96-28C. $45.00. Keith Keppel. jpg mysterious_ways_(1)-X2.jpg manage 301 K 18 Feb 2016 - 23:49 BrockHeilman Please contact Brock Heilman for image use. jpg mysteriousways1.jpg manage 76 K 05 Sep 2018 - 15:26 Main.TLaurin Photo by Antanas Markevicius-Geles Iris Garden-Lithuania.